Just when I thought I was going to get some real work done in peace and quiet, I realized the my hearing is much better than I thought. I'm thanking God for great hearing, and great imaginations! Oh I had this going on in my kitchen a few days ago! All I could think when I saw the picture was: To infinity and beyond! That gets shouted often at our house. hahaha! 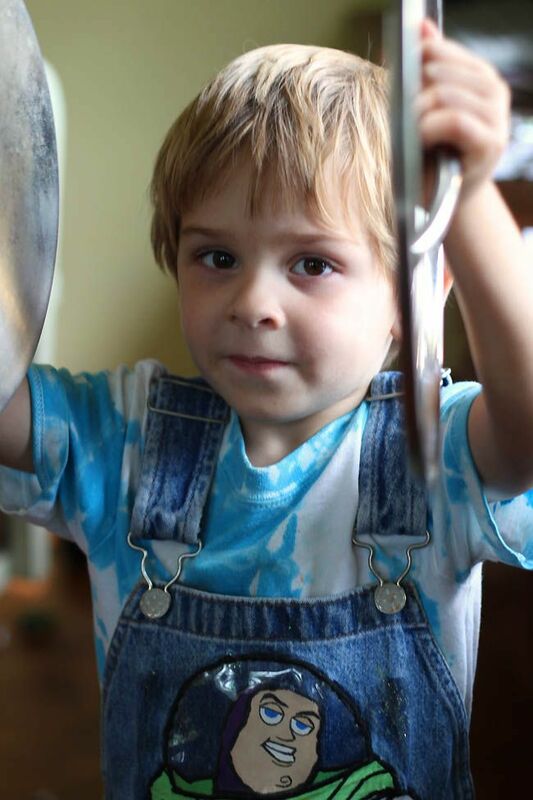 One day when my grandson was here he announced that he wanted to 'play drums' as he proceeded to open the drawer on the bottom of my stove, pull out pots and pans and start banging on them. oh my. While I hate to discourage his musical abilities, I'm not sure it's something I really want happening every time he comes over. Oh my! That expression is adorable. It's hard to tell if it's determination, mischief or maybe it's just hidden glee that he's having so much fun AND he made you get the camera! LOVE IT! Quite is so overrated any way! Beki... I wrote a post a couple of friedays ago, inspired by your idea... but sadly you weren't doing Fingerprint Friday that week... but finally I spotted it and have linkedup.